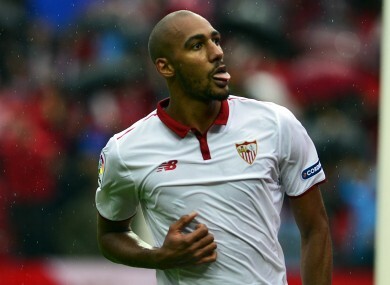 SEVILLA MIDFIELDER STEVEN N’Zonzi has agreed a deal that could see him join Juventus this summer. N’Zonzi — who has previously been linked with Barcelona — impressed under Jorge Sampaoli last season. The 28-year-old has a release clause of €40 million, and it is understood that Sevilla would be willing to take the payments in instalments. As such, Juve are preparing a bid that would see them pay the amount over a period of two to three years. Sevilla are also interested in replacing N’Zonzi with Mario Lemina, who Juventus themselves value at €20m. Everton held talks with the Bianconeri on Wednesday regarding a potential move for the former Marseille man, but as yet it is not clear whether any deal was done. If signed, N’Zonzi would face competition for a starting berth from Sami Khedira, Miralem Pjanic and Claudio Marchisio as Massimiliano Allegri looks to bolster his squad following their defeat to Real Madrid in the final of the Champions League. The former Milan boss has confirmed he is interested in signing Bayern Munich winger Douglas Costa while moves for Sampdoria forward Patrik Schik and Arsenal goalkeeper Wojciech Szczesny are in the pipeline. Email “Former Stoke midfielder agrees to join Juventus in €40m deal”. Feedback on “Former Stoke midfielder agrees to join Juventus in €40m deal”.